It seems that Senator Michael Bennet is still a little wet behind the ears when it comes to Washington, D.C. and the role of a sitting United States Senator. The rules of D.C. engagement are pretty simple: you can be a partisan pitbull and use your political energy to attack the other side, or you can be the politician that seeks compromise and consensus. What you cannot do is be both. That. Does. Not. Work. Bennet has fancied himself as the reluctant businessman who entered politics to “make things right.” With his business background, Bennet still has strong allies among the GOP donorati in Colorado, but he pretty much left the position of “bipartisan dealmaker” when he decided to run the Senate Democrats’ slash and burn campaign machine as head of the Democratic Senatorial Campaign Committee (DSCC). And he hasn’t looked back. We’ve spent a good deal of time calling Bennet out for his involvement in the current IRS scandal that has been widely condemned by Republicans and Democrats alike. Since then, Bennet has been trying desperately to distance himself from the growing IRS mushroom cloud suffocating the Obama administration. Mr. Bozzi, we couldn’t agree more. The problem you and Sen. Bennet are currently experiencing is this: Bennet is responsible, Bennet is the problem. Bennet signed and sent his letter to the IRS admonishing them to attack non-profits and highlighted only a conservative group in his press release trumpeting the letter. Bennet is in no place to condemn a partisan witch hunt that he himself called for. Much like his misunderstanding of the rules of combat in DC, Bennet doesn’t seem to understand that you can’t pretend to be concerned about a partisan attack when you called for it in the first place. My friend died in that restaurant that night and I was hoping that after 20 years, the families and friends of the victims could finally take a step forward but its horrible to have a governor slap us in the face when we have waited so long. 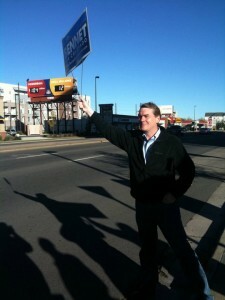 I am a independent and will vote for anyone but Hickenlooper in the next election. If getting him out of office is the only way the victims will have justice then so be it. I am ashamed to have him in our capital and I wish he would resign since he cannot seem to make the toughest decisions. YOU FAILED US HICKENLOOPER! Will you let Holmes live as well? What's the point of even having a justice system if you put your own needs ahead of the needs of the families and victims. Do not relent. Just like the democrats who 'targeted' races and continue to 'target' races but scream bloody murder if Republicans do it. Do not let this issue go. He is a partisan hack.